I’m going back to the college conferences and I am moving to the west coach next. The Big West Conference will be next, starting with the track at Cal State-Fullerton. 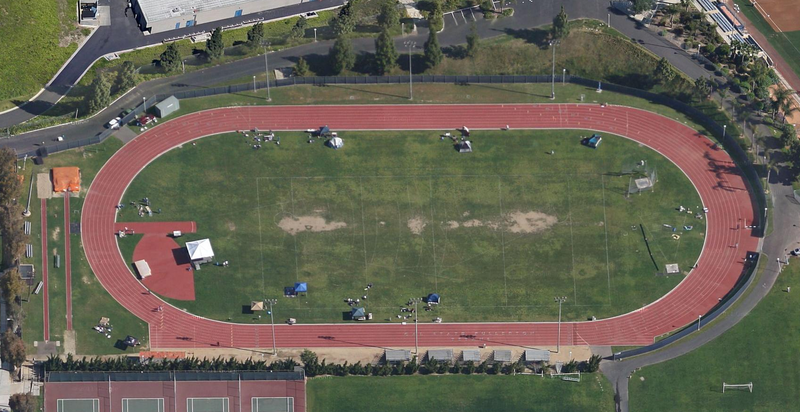 The Titan’s home is a track & field-only facility, and they have plenty of space to use. The throws are all on the inside. The long and triple jumps, and the pole vault, are just outside on the west end of the track. They have kind of an interesting set-up with the pits and the runways. There are two runways parallel to each other. If there are two pits for each, the sandpits are always on one runway, with the pole vaults pits on each end of the other runway. Here, they have one of each on each end, but opposite runways. So when you are pole vaulting, you are always on the right side, no matter what direction you are vaulting. I’ve never seen this before. Another interesting thing that I noticed about the Cal State-Fullerton program is that they have both men’s and women’s teams for outdoor track, but only a women’s team indoors.